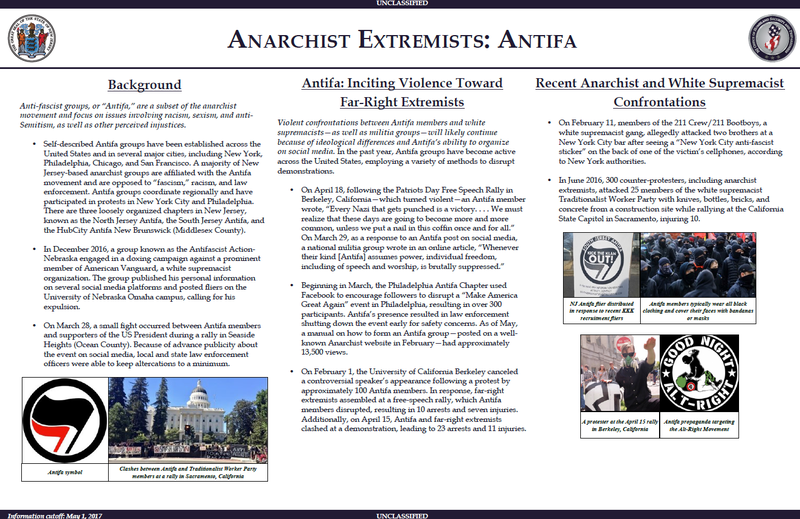 • Self-described Antifa groups have been established across the United States and in several major cities, including New York, Philadelphia, Chicago, and San Francisco. A majority of New Jersey-based anarchist groups are affiliated with the Antifa movement and are opposed to “fascism,” racism, and law enforcement. Antifa groups coordinate regionally and have participated in protests in New York City and Philadelphia. There are three loosely organized chapters in New Jersey, known as the North Jersey Antifa, the South Jersey Antifa, and the HubCity Antifa New Brunswick (Middlesex County). • In December 2016, a group known as the Antifascist Action-Nebraska engaged in a doxing campaign against a prominent member of American Vanguard, a white supremacist organization. The group published his personal information on several social media platforms and posted fliers on the University of Nebraska Omaha campus, calling for his expulsion. • On March 28, a small fight occurred between Antifa members and supporters of the US President during a rally in Seaside Heights (Ocean County). Because of advance publicity about the event on social media, local and state law enforcement officers were able to keep altercations to a minimum. Violent confrontations between Antifa members and white supremacists—as well as militia groups—will likely continue because of ideological differences and Antifa’s ability to organize on social media. In the past year, Antifa groups have become active across the United States, employing a variety of methods to disrupt demonstrations. • Beginning in March, the Philadelphia Antifa Chapter used Facebook to encourage followers to disrupt a “Make America Great Again” event in Philadelphia, resulting in over 300 participants. Antifa’s presence resulted in law enforcement shutting down the event early for safety concerns. As of May, a manual on how to form an Antifa group—posted on a well-known Anarchist website in February—had approximately 13,500 views. • On February 11, members of the 211 Crew/211 Bootboys, a white supremacist gang, allegedly attacked two brothers at a New York City bar after seeing a “New York City anti-fascist sticker” on the back of one of the victim’s cellphones, according to New York authorities. • In June 2016, 300 counter-protesters, including anarchist extremists, attacked 25 members of the white supremacist Traditionalist Worker Party with knives, bottles, bricks, and concrete from a construction site while rallying at the California State Capitol in Sacramento, injuring 10.